Previous Wednesday Wisdom #6: Avoid the faults of your nation. I have an OLPC – and lent it to a colleague the other day as part of his eReader session (he was trying to gather as many e.g.s of hardware as he could, as well as discussing the eBooks we have via the library). Seemed to go down well with the audience. It’s also likely to survive best if you decide to read in the bath & drop it! and, until I get my hands on one, somewhat unconfirmable by me! 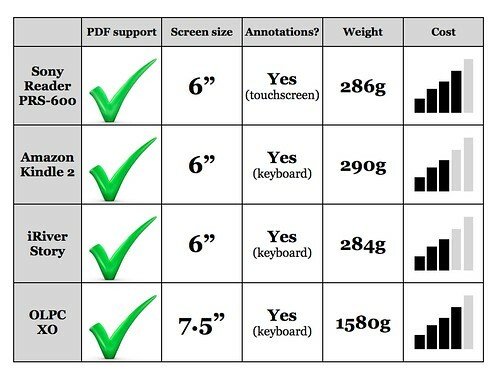 This is where the problems start for me – An ebook reader that size will cost over £500 for a single use object and anything smaller is likely to be frustrating to use and cause more eye-strain for me (in terms of reflow issues and diagrams being too small etc) then reading of a TFT screen.